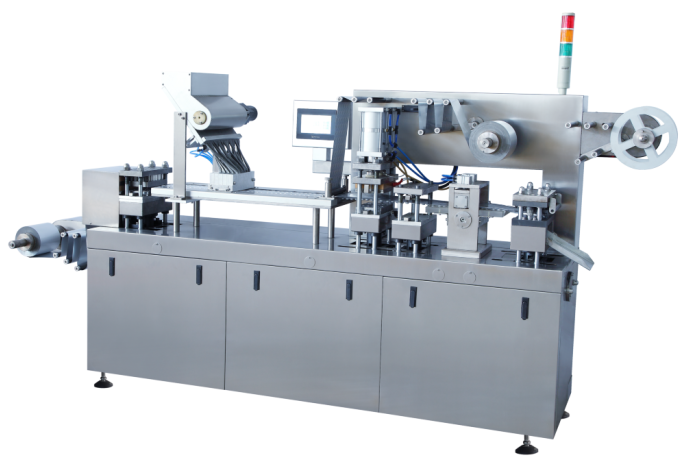 DPP-180H high-speed al-al blister packaging machine, the machine is an advantage at home and abroad for innovative plastic packaging machine design, machine key parts of the company a number of innovative technologies. Packaging for the pharmaceutical industry, tablets, dragees, capsules, also packaged foods and small metal parts, electronic components. The machine set coil unwinding, aluminum feeding, blister forming, filling materials, waste recycling, plastic heat sealing, printing batch number, textured indentation, forum cutter display counting ten functions in one machine, packaging materials good seal, safety and health. Variable frequency stepless speed regulation, servo traction, adjust the stroke of a key in place. The stroke can be adjusted within 30-110mm, which is easy to adjust with correct synchronization. Adopts plate-type mould, positive-pressure forming, featured by batch number printing,creasing and cutting,aluminum-foil/plastics automatic feeding, automatic alarm for broken—piece and finished-piece and automatic stop etc. Equipped with one set general feeder,which filling percentage reaches 99.5 and above. The feeder is fitted with dust exhaust joint so can overcome the dust problem duting feeding. Adopts registering matching heating so that can reduce the heat energy loss of heater to the least, and the required temperature will be greatly reduced. This machine has small volume, light weight, cramped structure, easy operation amd maintenance.